SPACE STATION FLYBYS: The International Space Station is making a series of bright flybys over North America and Europe this week. Check the Simple Satellite Tracker to find out when to look. And don't forget, there's an app for that, too. THE TREE OF AVATAR: NASA's Solar Dynamics Observatory (SDO) is doing more than just taking crisp pictures of the sun. It is revealing our star as a place of intense and sometimes even alien beauty. In today's image, we see "The Tree of Avatar." The trunk of the tree is a twisted, gnarly pillar of magnetism containing hundreds of millions of tons of relatively cool plasma. The canopy is a cloud of million-degree gas. As solar physicists watched this tree on April 19th, it exploded, producing one of the biggest eruptions in years: movie. The colors in the movie trace different temperatures. Reds are relatively cool (60,000 K - 80,000 K); blues and greens are hot (1,000,000 K - 2,200,000 K). The tree's cool trunk rapidly heats up as it rises into the blast, and the canopy cools down as it falls in pieces back to the sun. Go ahead and watch the movie again. Once is not enough! PLANET WEIKERSHEIM: For several days last week, something unusual happened in the skies of Europe: air traffic came to a halt. Almost every flight was grounded because of the volcano in Iceland. 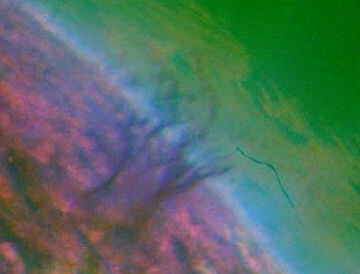 "The sky took on a strange appearance," reports Jens Hackmann of Weikersheim, Germany. "It was totally uninterrupted by contrails! So, I took several pictures using my Canon 5D Mark II and put them together in the form of a 'little planet' panorama." 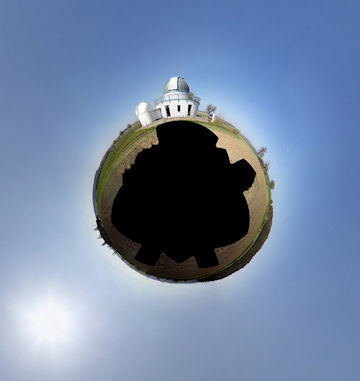 The dome in the image is Hackman's backyard observatory. Planet Weikersheim appears to be hollow, but that's just because "I forgot to take pictures of the ground," explains Hackmann. "But who wants to see my feet?" Indeed. Star trails also looked great during the flight ban. Click here for vertigo. On April 29, 2010 there were 1116 potentially hazardous asteroids.